Another busy week, including the kick-off of this year's A to Z Challenge, a few big reviews, a guest post, and the usual features. Also, for those of you who missed it, I had the honor of stopping by SCy-Fy for an interview with S.C. Flynn. A pair of new additions this week. 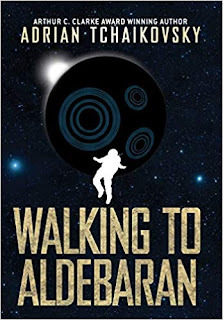 The first was a digital addition that I spotted on NetGalley and just couldn't possibly pass up, and the second is a physical addition that I've been eagerly waiting. Vampire Strippers from Saturn by Vincenzo Bilof - Time is infinite, and so are strippers. The beautiful and sultry Rene leads her trio of vampire strippers from (around) Saturn to destroy Earth. Their demonic foes—the plots—have hunted them across time; Earth is the last remaining planet with sentient life in this version of the universe. 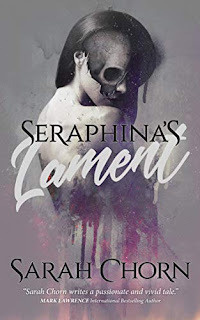 Rene’s love affair with a man who is half-horse, half-boy in a future version of Earth threatens her desire to inspire the apocalypse; if the vampire strippers fail to destroy the world now, men will be nearly extinct, and women will be hunted for sport by the surviving males. True love, time travel, bad music, shapeshifting plots, and a brooding supernatural detective named Will decide the fate of Earth in more than two realities. Can Rene prevent an apathetic future while allowing Earth to survive? Time travel, it turns out, really isn’t all that complicated, and neither are women. The Dinosaur Lords by Victor Milán - A world made by the Eight Creators on which to play out their games of passion and power, Paradise is a sprawling, diverse, often brutal place. Men and women live on Paradise as do dogs, cats, ferrets, goats, and horses. But dinosaurs predominate: wildlife, monsters, beasts of burden – and of war. Colossal planteaters like Brachiosaurus; terrifying meateaters like Allosaurus and the most feared of all, Tyrannosaurus rex. Giant lizards swim warm seas. Birds (some with teeth) share the sky with flying reptiles that range in size from batsized insectivores to majestic and deadly Dragons. 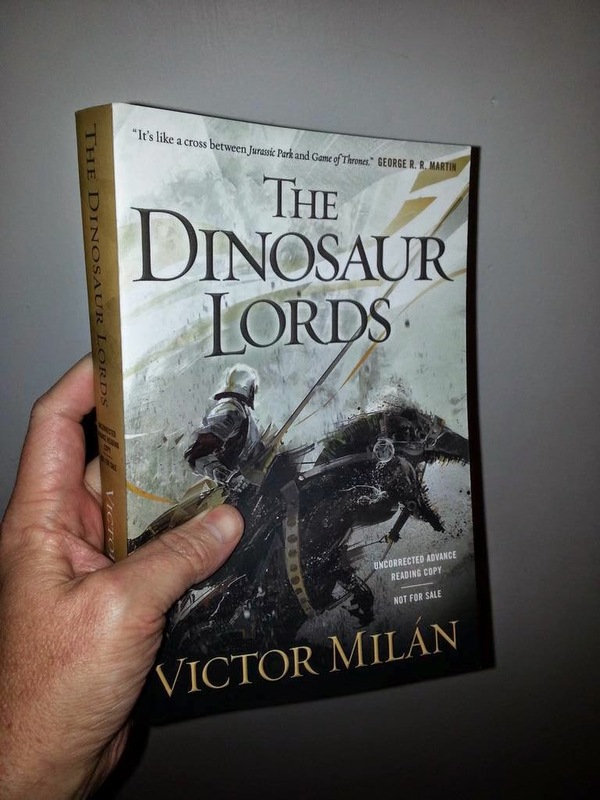 Thus we are plunged into Victor Milán's splendidly weird world of The Dinosaur Lords, a place that for all purposes mirrors 14th century Europe with its dynastic rivalries, religious wars, and byzantine politics…and the weapons of choice are dinosaurs. Where we have vast armies of dinosaur-mounted knights engaged in battle. And during the course of one of these epic battles, the enigmatic mercenary Dinosaur Lord Karyl Bogomirsky is defeated through betrayal and left for dead. He wakes, naked, wounded, partially amnesiac – and hunted. And embarks upon a journey that will shake his world. Five villains, one legendary general, and a final quest for vengeance. 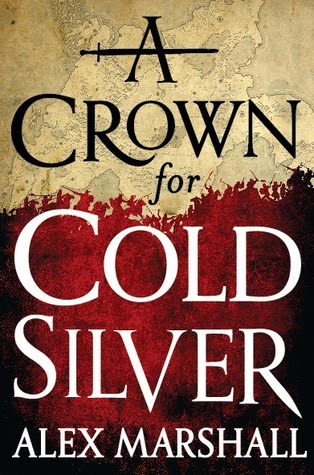 I'm only a few chapters in (not much time for reading this past week), but so far I'm liking the tone, the characters, and the dark sort of humor. Mad Max meets World War Z and I Am Legend in this thrilling tale that has it all. 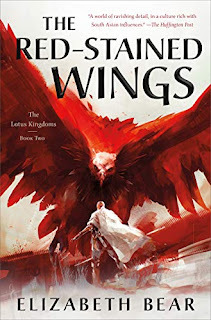 That's the blurb that hooked me, and I'm really hoping it can deliver on the promise of a journey across a dark and dangerous land populated with heroes, villains, madmen, and hordes of zombies. Vampire Strippers from Saturn? That sounds different, Bob! I hope you'll enjoy your new books, have a wonderful weekend. Vampire Strippers From Saturn - sounds like it will be a movie soon. Thanks again for hosting me on Monday! Vampire Strippers from Saturn...it sounds like a dodgy film on the Sci Fy Channel..! *grins* Enjoy! Looks like Alex, you, and I all think alike - first thing I thought of was a crazy SciFy flick. Vampire Strippers from Saturn sounds very steamy hope you like it. I'm hoping there's a little B-movie cheese with that steam! I haven't heard of these but I hope you enjoy them. Oh, I want The Dinosaur Lords! Jealous. Hope you enjoy it! Yeah, extremely excited to have landed a copy of that! The Dinosaur Lords!!! I need it! 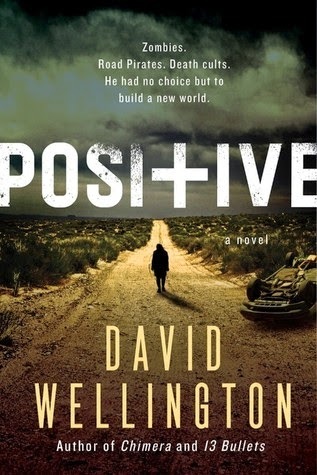 I can't wait to read Positive, it sounds awesome. Have a great weekend, happy reading! Positive I've had kicking around on my e-reader for months now, but Dinosaur Lords was a very nice surprise. 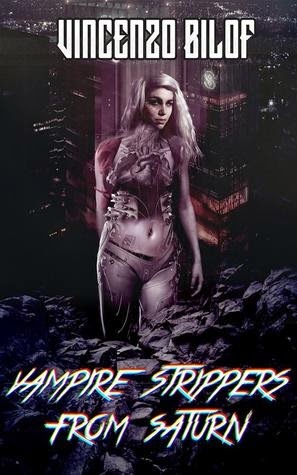 You know what's funny, I saw Vampire Strippers from Saturn on Netgalley and literally, I kid you not, the first thing I thought of was "This would an excellent title for Bob's WTF Fridays!" I'm really curious about Dinosaur Lords too, that one looks really interesting. Great minds do indeed think alike - that's exactly where I'm thinking it fits. Am not a fantasy / sci fi or horror fan but love hearing about books in other genres, and.... LOVE the title 'Vampire Strippers from Saturn'. Surely that alone makes it worth reading! Wow, what an interesting title. Vampire strippers from Saturn. Enjoy!